In Beat the Bus no 4, I was excited to check out using the M7 Cycleway to get to work. It just so happened my son was meeting a manager at a giant warehouse in an industrial estate called Oakdale, so we began investigating ways he could commute by public transport. The nearest station was Rooty Hill on the edge of the M7 Cycleway. Google streetview showed there was a decent bike path in the area, I needed no more inspiration. I dropped him off and set off to explore St Clair, Minchinbury and then ride back from Rooty Hill Station. Rooty Hill Station is the closest station to the M7 Cycleway, it is currently getting upgraded to include lifts and bike support. 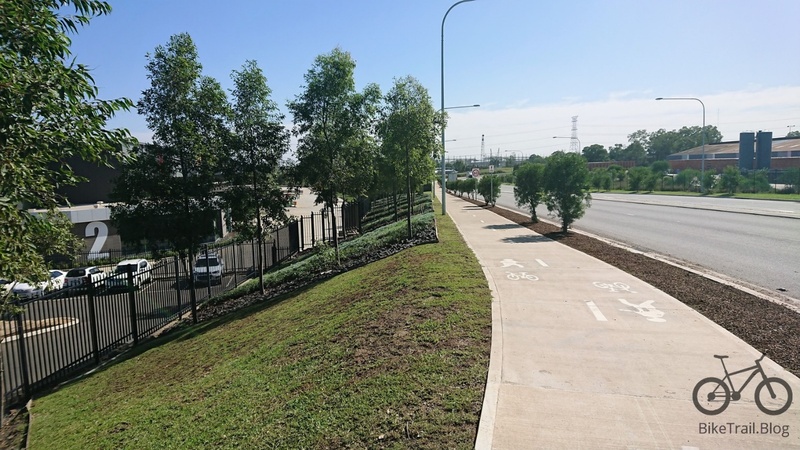 The ride from there to the Old Wallgrove Rd turnoff is a great section of the M7 Cycleway, its flat, you get to cross the spectacular M4 – M7 crossover on your own bike track and the turn off is simple. The ride along Old Wallgrove Rd is on a perfect concrete bike path with a couple of crossings of dead end streets. You then cross a big crossing where Old Wallgrove actually turns and there is another perfect cycleway. The ride to Oakdale Estate is very pleasant, there are a lot of giant warehouses around. All up the ride is a shade under 10km. Perfect for a spot of morning exercise and it took 26 minutes at 20km per hour. The bus option though is not the best. The best time is 45 minutes which includes a walk of 20 minutes. Off peak, busses can be well over an hour. The real story here is probably 99% of people drive their cars and are missing a great opportunity to park somewhere else or just ride and get some great safe exercise. Minchinbury, Doonside, Rooty Hill, Quakers Hill and maybe Cecil Hills are all within range of a 45 minute cycle, especially on an eBike. Rooty Hill Station has bike lockers so I believe which means you can just leave your bike at the station and train home. My son may be doing just that. Summary – Rooty Hill to Horsley Park is 25 mins by bike at 20km per hour saves 20 minutes in the bus – Everyone that lives in the area should be doing it once a week for exercise and leaving the car at home.